Current Creek or Current River is located near Montauk State Park has some of the bigger fish in the state. The nine-mile stretch of river between the park and Cedar Grove Bridge is a blue ribbon trout stream, and some of the best fishing anywhere. If that is not enough, there is an eight-mile stretch of white ribbon fly-fishing below this stretch. Having two great stretches of fly fishing so close together is pretty amazing, you can’t really ask for much more than that. This river near Eminence MO holds large Brown trout, with a very large percentage big enough to be kept at over 18”. In addition to the nice Brown's, there is also a good supply of Rainbow’s mixed in as well. Determining what flies to use on this stream is the tough part since there are no great hatches. You may find yourself using non-traditional patterns like Zug bugs or leeches along with traditional patterns like Pheasant Tails and Hare's Ears. Copper Johns and Pheasant Tails can bring success, but figuring out what to cast is very difficult on this river so bring a nice assortment with you. 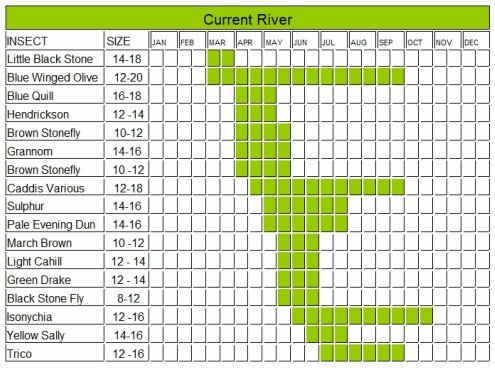 The river is great for floating mostly because of the limited amount of access points to the river for the waders. You can enter the river at Montauk State Park near the last parking lot in the park. There is also access off of some country roads near the stream, at Baptist Camp Access, Parker Access and Cedar Grove Access. Below the Tan Vat Access is where the fly-fishing really comes alive and is a great place to pull up some river to call your own. The lower white ribbon stretch has 3 main road access points at Cedar Grove, Welch Spring and Akers Ferry. You cannot wade the entire river of either section because some of the pools are too deep to wade across. This is why some people will use a float tube or boat to fish many parts of the river. You will need to hit a stretch of river and work all the water you can in both directions and either repeat this process or move to another section. Current Creek is a great trout stream even though the access is somewhat limited. Some times you just need to work a little harder to find great fishing. When you find a great spot here and finally figure out what the fish are looking for you are in for a great day. Leave the Current Creek page and return to Missouri page.